After gaining the majority in the House of Representatives in the 2010 election, Republican strategy has been to gridlock every Democratic initiative, enough to earn them the sobriquet of “The Party of No”. But think tanks on the right and some of the more prominent figures in the Party have come to realize that simply accusing the left of “class warfare” every time the subject is raised will not quell the growing anger over income and wealth disparity and stranded mobility. But their solution is certainly not to amplify current government programs. On its 50th anniversary, they point to Lyndon Johnson’s “War on Poverty” as a failure for treating the symptoms rather than the causes. It’s a point well taken. The conservative position is that the mix of welfare, food stamps, housing allowances, the minimum wage, Medicaid, etc. may help people but they do nothing to extricate them from the bottom stratum of society. All simply create a culture of dependency. Outfits such as the American Enterprise Institute, and Party luminaries such as senators Mike Lee and Marco Rubio, and congressmen Paul Ryan and Eric Cantor, propose a fresh approach. House Republicans opened a campaign at the beginning of March for a total overhaul of social programs with a 204-page critique of federal anti-poverty efforts from House budget chief Ryan. He argues that scores of programs actually create a “poverty trap” that keeps people from getting ahead. The Republicans’ new ideas decidedly emphasize creating incentives for people to find work. Theirs is a widespread belief  despite an economy with far fewer jobs than people looking for them  that high unemployment is caused by people not trying hard enough to find jobs, a lethargy induced by too much money from government social programs. At the core of their proposal is the one social program they do like and want to expand, the Earned Income Tax Credit (EITC). It fits their philosophy because only those who work are eligible for its benefits. Created in the 1970s, that program rewards low-income people by refunding taxes and paying them to stay in the workforce rather than dropping out. Democrats who chortle at Republican adoption of something that seems ripped from the socialist playbook need to be reminded that the EITC was begun under Republican President Ford, expanded twice by Reagan, and again by the first Bush. Reagan called it the “best anti-poverty, the best pro-family, the best job creation measure to come out of Congress”. 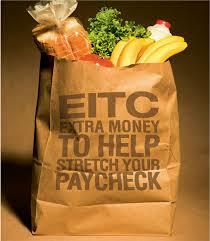 The EITC is heavily skewed toward persons or couples with children. The childless must have incomes about 60% less than those with children in order to qualify, and that for a much more meager benefit. In addition to increasing benefits, part of the Republican expansion plan would right this imbalance to make it more of a general poverty program than a child protection scheme. So far the plan has only been advanced conceptually, as a challenge to Democratically favored policies. No one seems to be addressing the question of how much this would cost. And it would be costly, because for such a program to succeed, benefits would need to taper off very gradually as a recipient earns more. If too much of added earnings are offset by a drop-off in benefits, the work incentive at the core of the idea will collapse. Entirely lacking in the conversation is any mention of what to do about those who are unable to find work when there is no work to be found no matter their effort. As Republicans want all spending to be offset by savings elsewhere, presumably their plan would be funded by cutbacks of current social programs. No one is proposing that we eliminate the federal safety net, says the Weekly Standard, Bill Kristol’s publication on the right, but “all believe it’s possible to dramatically shrink the number of Americans who rely on it”. One casualty, if conservatives were to have their way, would doubtless be the minimum wage, to which they are adamantly hostile. Although over 30% lower than it was in the 1960s, there are those who argue for it to be reduced still further. With the subsidy of a broadened EITC, a person could accept a job at, say, $5 an hour or still less, thus entering the workforce and learning skills to equip them for higher paying jobs, goes the argument. The counter argument is that, in the absence of the minimum wage, employers would take advantage of a workforce that is paid a subsidy and drive wages still lower. The minimum wage applies a brakes to that downward spiral. But in reaction to the Republican complaint that current safety net programs just pay the bills and do nothing to elevate people’s standing in life, Democrats would argue that just supplementing income so that people can accept penury wage jobs is stranding them in the very “poverty trap” that Paul Ryan says is the problem with liberal programs. Any Republican overhaul must go further. Job training is routinely included in the list of government tools for reducing unemployment, but when do we see reports of whether people are being trained for job categories that actually exist? A recent Wall Street Journal editorial said there is “widespread recognition that they do little good”, that four reports from the Government Accountability Office in the last few years concluded there are too many programs, too little accountability, no less than 47 programs in nine agencies, all overlapping with at least one other, and with employment outcomes that were either negligible or "tended to be small, inconclusive, or restricted to short-term impacts". As for whether the government knows where the jobs are, retiring Oklahoma Senator Tom Coburn has delved into job training in his state and found that culinary students wound up as funeral attendants, tour guides, baggage porters and telemarketers. Instead of job training, Republicans would could press for the government to fund  through subsidy or tax credits  on-the-job apprenticeships, which by definition equip a candidate with a needed skill and work that graduates into a permanent job. The same principal applies to the long-term unemployed. At the beginning of the year Republicans blocked continuance of 99-weeks of federal unemployment payments, but with nothing as replacement. A sensible law would be for businesses to earn a tax break for hiring those still jobless when the near-universal cutoff of 26 weeks of unemployment insurance benefits is reached. It would be law that stays on the books permanently to automatically take over when unemployment payments cease. Republican Sen. John Thune of South Dakota favors this idea and thinks the reward to businesses should be elimination of the employer portion of payroll taxes for a time  and we would add that the length of the tax waiver should be based on the length of time the person had been unemployed. It is often reported that jobs are available, but in locales where people are not. It is also equally often reported that there is no end of jobs, but Americans lack the skills to fill them. As to the first, Thune thinks the employment problem would be eased if the government were to lend $10,000 to families to pay for them to move. David Brooks, a conservative columnist at the New York Times, says Americans have become steadily less mobile. In 1950, 20% moved in a given year. Now, just 12%. Between the 1980s and 2000s, mobility among young people dropped 41%. Holding many back is the money sunk in houses with mortgages that are underwater. Otherwise, says the job-search website monster.com, nearly three-quarters of job seekers say they would relocate for new work. Brooks says “a big factor here is a loss in self-confidence. It takes faith to move”. So in addition to Thune’s loan, we would add a government data base that constantly reports not on job openings but on the general job market in the various industries everywhere in the country to help the unemployed discover where to go. Otherwise, people have no reliable way to judge. That same monster.com data said that employers are not willing to hire people sight unseen, however. A segment on the PBS NewsHour offers a way how this could be remedied. The head of Fabric Images, a company in Elgin, Il, had found diplomas and grade point averages to be useless in evaluating job candidates. "What does an 'A' mean to an employer today? 'I got an 'A' in math'. What does that mean? Nothing". Instead he discovered WorkKeys, currently in use by over a thousand companies. It tests applicants with actual workplace scenarios to measure how well they can decipher charts, graphs and other visual information, convert ratios, measurements, make calculations across a variety of situations and understand memos and instructions. It identifies capable workers irrespective of whether or not they had good grades or even graduated high school. This method could be used remotely to spot someone in Charlotte as the perfect fit for a job in Boise, for example. Republican planners need to come up with specifics such as this to move beyond the conceptual. As to the other problem  Americans lacking in skills  whichever party that intends to campaign on upward mobility should inform itself of the P-Tech high-school model, which is experimenting with making high school six years with a curriculum that places heavy emphasis on STEM (science, technology, engineering, math) courses. Students emerge with an associate’s degree  and in pilot programs  a job. P-Tech  short for the clumsy “Pathways in Technology Early College High School”  is meant to confront a future in which Georgetown University estimates that two-thirds of job openings will require post-secondary education. IBM, for one, is setting up P-Tech schools rapidly and pledges to start every graduate in a $40,000 a year job  an immediate move into the middle class. But for the idea to scale beyond corporate sponsors, planners on the right or left need to think about funding those final two years. Paul Ryan’s opus was released just as this is written. If it is only a critique of liberal programs and lacking in specifics such as we’ve outlined, we may still be left with generalities such as Sen. Rubio speaking of rolling all federal programs into one and the misplaced emphasis of him and others wanting the money to be given to the states as block grants for them to do with as they see fit. This is the usual conservative mania for dismantling federal government involvement and returning everything to the states which will only serve to complicate what could be a sensible reform movement. Washington already has the mechanisms for national distribution of funds and programs. Whether Social Security payments, Medicare reimbursements, unemployment benefits  all flow smoothly and electronically into our bank accounts. Splintering the system into 50 states to satisfy conservative ideology, each with the wasteful costs of its own administrative bureaucracy, each designing data processing systems 50 times over, would be senselessly inefficient. And, as with Obamacare (have Rubio et al. forgotten already the difficulties states had with that? ), each state system would have to reach into government data repositories anyway to determine income and eligibility. 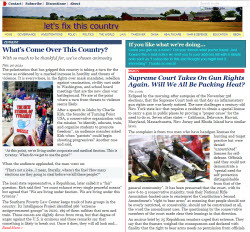 Moreover, atop the states there would still be the need for a federal oversight agency to audit all 50 states for fraud and proof that the money was spent on categories allowed by the block grant statutes, because, let’s remember, this is taxpayer money collected from all of us by the IRS and we will want an accounting. That Republicans are beginning to confront the problem of the hollowed out middle class and poverty level wages with sensible ideas is welcome. There's always been the fond notion of conservatives that private charity, not government assistance, is how society should take care of the poor. Arthur Brooks, head of the most prominent conservative think tank, the American Enterprise Institute, and another who wants the EITC expanded, points out that the $40 billion that Americans donate to human assistance organizations annually would give each person now receiving federal food aid a mere $847 a year. We might finally be rid of that.